The William Hill High 5 offer is one of a number of offers ran by William Hill which can return a good profit when matched betting. £100 of free bets can be claimed on any one race and with the offer running almost every day, this has the potential to be a very big earner for matched bettors. If you back a horse in selected races which wins by 5 or more lengths, William Hill will credit your account with a 15% bonus on your winnings as a free bet up to the value of £100. The offer is available on selected UK & Irish jumps races which are announced on the William Hill website each day. It is also available on all jumps races shown live on ITV. During jumps season, the High5 offer from William Hill runs every day of the week and so there is huge potential to make a good sized profit. The offer is very simple to do and takes little time which means it this offer should be on your to-do list for daily matched betting tasks. The strategy for making a profit from William Hill's High 5 offer is to simply back and lay a hose which you think will win by 5 or more lengths. 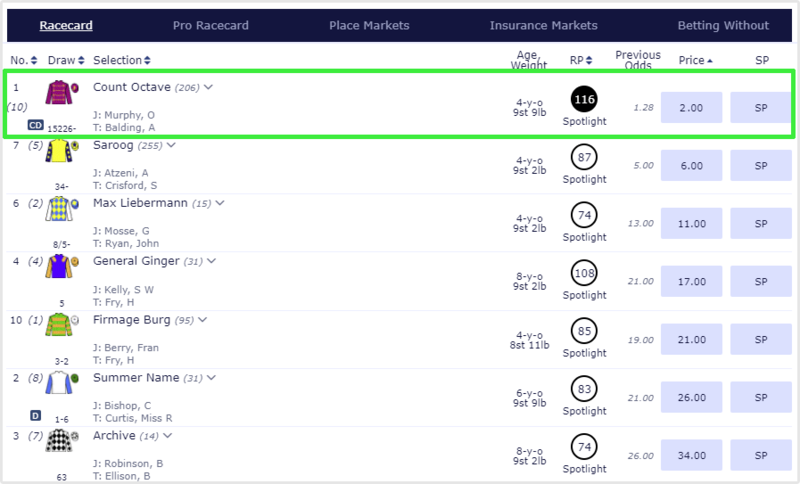 There are a couple of points to consider when choosing a horse to back which will ultimately increase your chances of winning and returning a greater profit over time which we cover below. You'll only make a profit with this offer if the horse you back wins the race by 5 or more lengths and so it's logical to back one of the favourites as they have a greater chance of doing so. It's important to keep your qualifying losses to a minimum as your horse won't win by 5 lengths every time and it's possible that you don't back a winner for multiple races. If you're qualifying losses are high, your bank could take a hit. The easiest way to find a close match is to simply use an odds matcher or a racing matcher. Both will work well with the racing matcher making things slightly easier by displaying the EV for each horse. The first thing to do is to take a look at the horse in an eligible race and to see if there is a clear favourite. As you can see from the screenshot above, 'Count Octave' is a clear favourite in this race. If we can get a good match on this horse then it would make the perfect choice for the High 5 offer. The next step is to check the odds matcher or horse racing matcher to see if 'Count Octave is a good match and if there are any other close matches. 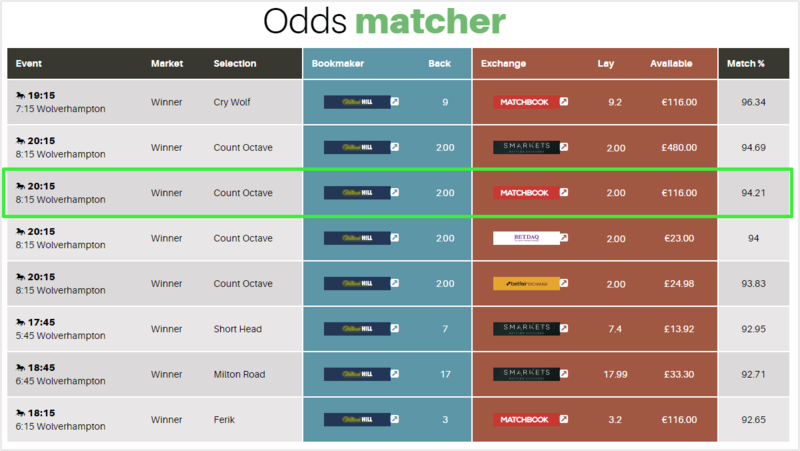 The Odds Matcher displays a good match for High Octave with back and lay odds of 2.0 and so now we need to calculate our lay stakes based on our back stake. To do so, we use a matched betting calculator. The calculator shows us that with a stake of £200, our qualifying loss will be £2.28. This is what we will lose if Count Octave does not win the race by 5 or more lengths. We know that if Count Octave does not win the race by 5 lengths or more, we will lose £2.28. However, if our horse does win the race by 5 or more lengths we will receive a 15% bonus on our winnings as a free bet. If we didn't lay our bet we would stand to make £200 profit if our horse won. Therefore, if our horse wins by 5 or more lengths, we'd receive 30% of £200 as free bets which works out as £30. If we can expect to extract £24 profit from our £30 free bet, we would stand to make an overall profit of £21.72 should our horse win by 5 or more lengths. The maximum free bet that you can receive is £100 and so if you find a very close match, it is worth placing a back bet to the value of that which would return the £100 free bet should your horse win by 5 or more lengths. Example: If we are backing Count Octave to win at odds of 2.0, then we'd need to stake £666.66 on High Octave to win in order to receive the £100 free bet should it win by 5 or more lengths. This can tie up quite a bit of your bank and less stake would be needed should you back a horse with higher odds. However, by doing so, you are reducing the chances of your horse winning by 5 lengths or more and so are less likely to see a return. William Hill offers customers one odds boost a day which can be used on any bet. Unfortunately, the 15% free bet does not count towards the boosted amount but by using an odds boost you can reduce your qualifying loss and a lot of the time you can make the offer risk free by creating an arb. When you back a horse that wins the race by 5 or more lengths, William Hill will credit your account with a free bet within 1 hour. This free bet can be used on any sport and must be used within 4 days otherwise it will expire. To use your free bet to make a profit simply find a close match with odds of 5.0 or greater, place your free bet on this on William Hill and lay the bet on a betting exchange. 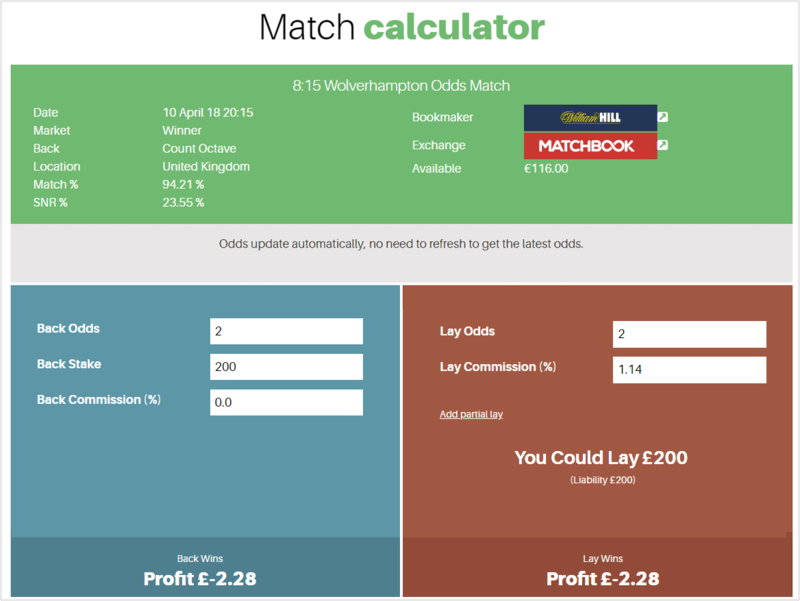 Use a matched betting calculator to work out your lay stakes. The William Hill High 5 offer is a profitable offer which can be completed daily during jumps season. The key points to remember are to find very close matches to keep qualifying losses to a minimum and to back strong favourites. This will give you a better chance of winning and keep losses low when you don't.